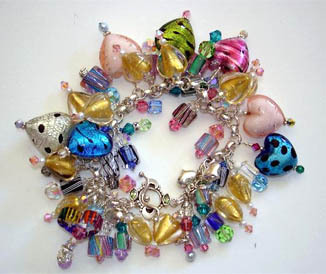 Artist Interview-Jean Yates of Pretty Kitty Dog Moon Jewelry! January 28 , by Barbe Saint John. I am the mother of five sons (add two grandsons, now, to that)! Two of our boys (ages 14 and 17 this January)Â are severely autistic. I spent their early years working hard on their educational requirements. This was really important at the time because nobody quite knew what children with autismÂ truly neededÂ as far as learning went. WeÂ were all just guessing and hoping.Â Then, when my oldest son got married four years ago, a little window opened up as far as I was concerned, timewise. It wasn’t as if he had been living at home, and then moved out, because he lived inChicago. It was just thatÂ some sort of hard to describeÂ mental shift occurred for me, giving me a tiny bit of freedom, time-wise. It was as ifÂ I no longer had to be quite asÂ concerned aboutÂ FIVE children, two autistic.Â I was confident my oldest son’s lovely newÂ wife would “take good care of him” (he is a lawyer, by the way). Â This changeÂ subconsciously spoke to me, saying, â€œSpend a little time doing something whichÂ you find personally interesting!”Â That something was making jewelry. I hit the ground running and within monthsÂ I was regularlyÂ in magazines and even on the cover of a book with one of my designs. How many hours a weekÂ do you spendÂ in the creative side of your business vs. the business side?Â You just made me laugh. I don’t even know how to answer this! Let’s just skip this one!Â What inspires youÂ creatively? What doesn’t inspire me?Â I have a fascination with words, the sounds of words,Â colors, music, feelings, beauty, nature, riding around in big cars and pretending I am still 16…good grief! I love everything! Therefore everything inspires me. I really live in the moment. I also really try to do my best at whatever it isÂ I am creating, so that it is a form of communication to some other person– anyone at all! –out there in the world. I am sending out a message. ThisÂ may beÂ because of my two children who have a hard time communicating. It is also probably due to my husband, who is so very funny, and makes me fall over laughing repeatedly during the day. He’s a big inspiration to me. Well, as a matter of fact, YES! Thanks for asking! I just wrote a super jewelry design book called Links by Jean Yates. The title is derived from the chain maille in the book (some simple but beautifulÂ designs) and also due to the fact that in orderÂ to be successful designers, we mustÂ create withÂ inspiration. It’s not good enough just to have a bunch of beads and stick them on some beading wire.Â Links shows you how to look within, and also outside yourself,Â so you can obtainÂ that inspiration. It alsoÂ quotes artistÂ friends of mine throughout the book, further illuminating aspects of the creative design process. It’s a beautiful book. I am incrediblyÂ proud of how it turned out. It is a North Light book. I will be at CHA this February, signing it and doing demos for my publisher. I am really happy people know who I am and like to learn things from me. That is just really great, as far asÂ I am concerned. I also like the fact that my blog is popular. Sometimes I make myself laugh writing it. So that’s good:Â I am having jewelry-related fun. It doesn’t seem like a goal, but it is if you realizeÂ I didn’t even have a blog a year ago. Â Where do you sell at primarily-website, stores, shows, etc?Â I sell on my site whenÂ I am not busy designing for magazines. I really love designing for magazines because I love looking at photos of things which I have created, and becauseÂ I love to teach. Frankly, this is the only way I can on any sort of regular basis. Â Who are some of your favorite artists and crafters?Â I love Kim Miles, Kate McKinnon, Emma Ralph, Cathy Lybarger, Jill Newman, Aislyn ofÂ Urbanmaille, Lisa Kan,Â Jamie Hogsett,Â Tammy Powley, all the Green Girl StudiosÂ people, Melanie of Earthenwood,Â and of course Margot Potter.Â If you need to know who any of these people are, just email me. They are all fantastic artists. Â What do you like to do in your spare time? If I am not making jewelry? I likeÂ talking on the phone to my friend or toÂ my husband, writing an Amazon review, helping a child here at homeÂ or one of our pets, watching tv, trying to read, orÂ attempting toÂ plan what I am going to eat at night (that is the time when I eat)Â and then, often, notÂ eating it. I also like answering interview questions. Â Â What advice would you give to someone who is interested doing jewelry as a business?Â If you are good engineering wise, that is your jumping off point. Then you have to learn to fly. To fly properly, you have to turn away from the other designers in someÂ fashion and just really go with what YOU love. It’s like being an explorer. To be a good designer youÂ have to be brave. Break away from the pack. Â If you do this,Â people trulyÂ will sense that you are an original andÂ want to buyÂ YOUR jewelry! Good luck! Â Thank you so much for this opportunity to be interviewed. It was fun! A wonderful interview! Thank you for sharing, Jean! well done Barbe. Jean’s work is beautiful. Barbe, Jean is an amazing person and I love you interview!